Anteroposterior view of the pelvis and anteroposterior view of the hip demonstrate concentric narrowing of the hip joint spaces bilaterally. Femoral heads and necks are hypoplastic indicating long term nature of the disorder. There are erosions around hip joints. 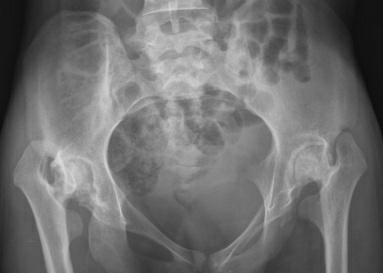 Developmental dysplasia of the hips would show shallow dysplastic acetabuli. Osteoarthritis of the hips would demonstrate hypertrophic osteophytes and asymmetric joint space narrowing with sunchondral sclerosis and cystic changes. 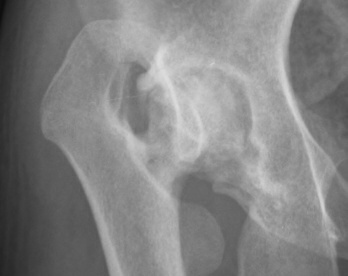 Avascular necrosis of the hip can be manifested by heterogenous appearance of the femoral head. The femoral neck is usually normal in the setting of AVN.